According to printed sources, the Voynich MS was discovered and purchased by Wilfrid M. Voynich in the Villa Mondragone, near Frascati, Italy, in 1912. To commemorate the 100th anniversary of this event, a celebration was organised in the same Villa on 11 May 2012. This event brought together experts and interested people from all around the world. On 11 May a series of presentations covering all aspects of the MS was given. This was attended by ca. 75 people including 3 regional and international media teams. 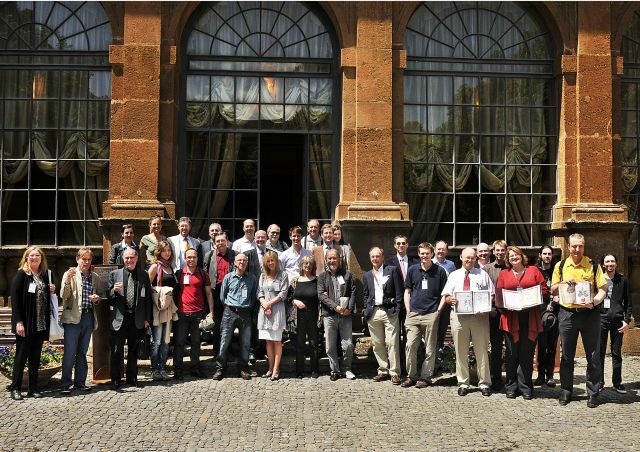 On 12 May, a maller group gathered together in the Scuderie Aldobrandini to exchange views on the Voynich MS. The setting of the event could not have been better. Villa Mondragone, bathing in sunlight throughout the day, is both a historically relevant place, and a fantastic decor for an event combining history and culture. The foto album provides ample evidence for this. This group picture of approx. half the attendance was taken after lunch (foto: Nils Finderup). See detailed programme with links to presentation abstracts. Both for the organisation and for participants the event has been a great success. 'Newcomers' to the Voynich MS were fascinated by its mystery. Long-standing experts have been overwhelmed by the new information and impulses, coming from the presentations and the many discussions held with peers they have never had the opportunity to meet before. The Consorzio Tutela Denominazione Frascati organised a wine tasting event, with a selection of regional snacks, served in the famous garden Portico. It was one of the unforgettable highlights of the day. and the kind support of the staff at the Villa Mondragone. The Sala degli Svizzeri was kindly made available for the event by the University of Rome "Tor Vergata". The Scuderie Aldobrandini was kindly made available for the event by the Mayor of Frascati. We are indebted to all our supporters and sponsors. See also the page with inks.